I was watching “Price is Right” while I folded some clothes. 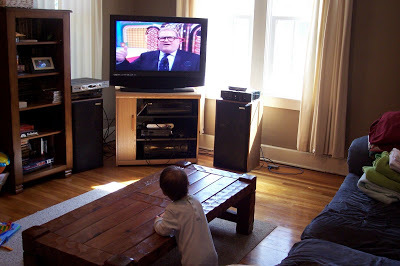 When I came back into the room, I noticed Cate was pretty into Drew Carey. (OK, so maybe it wasn’t Drew as much as the clapping, sounds and lights.) So after the showcase showdown, I put in a DVD more specifically tailored to her age. She seemed to like it too. Wait, how sad is it that i know that Drew’s better than he was? !